IndyCar star Danica Patrick says she has an announcement to make tomorrow during an appearance on ABC's "Good Morning America." However, sources tell Sirius Speedway that Patrick's announcement will focus entirely on her IRL career, and not on her much-discussed 2010 dalliance with NASCAR. Patrick bypassed her own public relations department Saturday, announcing her GMA appearance on Twitter. "I am heading off to New York for an announcement about next years plans," tweeted Patrick. "I will be on GMA Monday morning!" She gave no specifics on what will be discussed, but sources say her comments will concern a new, multi-year deal with Michael Andretti's newly named Andretti Autosport IndyCar team. Andretti recently completed a restructuring of Andretti Green Racing, after buying out former partners Kim Green and Kevin Savoree. He will field a trio of IndyCar entries for Patrick, Tony Kanaan and Marco Andretti next season, with a fourth car for Ryan Hunter-Reay also a possibility. No announcement is expected on Patrick's much-discussed -- though still not finalized -- part-time schedule of ARCA and NASCAR Nationwide Series races with JR Motorsports. Those plans are still progressing, however. Randy LaJoie's The Joie of Seating recently constructed a NASCAR seat for Patrick, and Sirius Speedway has learned that Patrick will drive a JR Motorsports Chevrolet in a clandestine test session at Daytona International Speedway within the next two weeks. Nobody associated with Patrick, JR Motorsports or Hendrick Motorsports will comment officially on the test, but anonymous sources within the Hendrick organization say that it will take place. Two races still remain in the 2009 NASCAR Sprint Cup season, but much of the talk in the Cup garage already centers on 2010. 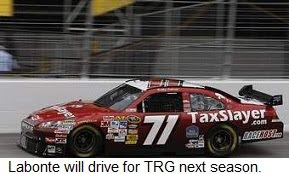 Former series champion Bobby Labonte confirmed this weekend that he has signed a one-year deal to drive the TRG Motorsports #71 next season, with a 12-race sponsorship from TaxSlayer.com. Labonte and TRG owner Kevin Buckler continue to seek backing for the remaining 24 events, and Buckler said he is also close to a decision on manufacturer affiliation for 2010. "We're talking to several manufacturers right now,” said Buckler. “We're in the middle of some strong negotiations with them, and… we have to do what's best for the team. I tend to be very, very loyal about stuff -- maybe too much so -- but I've got a lot of partners and other people to consider here. Our final decision needs to be based on what's best for TRG Motorsports." TRG has campaigned Chevrolets in each of the last two seasons, primarily because their cars were purchased in Impala livery from Richard Childress Racing. The team receives sheetmetal and some technological support from General Motors, but has reportedly received a competitive offer to jump to the Toyota camp next season. Buckler revealed that he will field a second car in the season-opening Daytona 500 with a yet-unnamed driver, and would like to make the second entry permanent, if sponsorship can be found. There are changes afoot at Roush-Fenway Racing, as well. Sources tell Sirius Speedway that Donnie Wingo will replace veteran Jimmy Fennig as crewchief of the #6 UPS Ford and driver David Ragan. Long recognized as one of the top nurturers of young NASCAR talent, Fennig is in his 13th season as a crewchief with Roush-Fenway, and has hinted that he is ready to cut back on travel in favor of a management position. The U.S. Army announced last week that it will return as sponsor of Ryan Newman’s #39 Stewart-Haas Chevrolet in 15 races next season. Stewart-Haas also announced a two-year sponsorship agreement with Ruiz Foods that will make its Tornados brand -- meat, cheese and tomato sauce rolled in a seasoned crust -– a major sponsor for five Sprint Cup races in each of the next two seasons. Tornados will make its primary sponsorship debut at Atlanta Motor Speedway in March, and will serve as an associate sponsor for both Newman and Tony Stewart in the other 31 events. 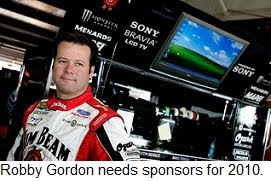 Gordon said that while sponsorship is difficult to find in these tough economic times, the situation has been exacerbated by some of the sport’s mega-teams, who he claims are cutting deals for far less than it costs to field a car. 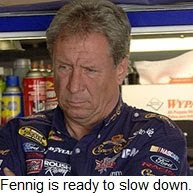 He called the trend, “sponsorship suicide,'' saying he expects to see more start-and-park teams next season. He pledged that he will not be one of them, however, vowing, “We're going to continue to work hard to sell races through March of next year. After that, I'm looking at a lot of weekends off." It’s as predictable as sunrise. Twice each season, in the aftermath of NASCAR Sprint Cup Series events at Talladega Superspeedway, the hue and cry begins to “fix the racing” at NASCAR’s largest track. Superspeedway racing is safer today than it has even been. It is not, however, safe enough to prevent NASCAR Nation from holding its collective breath while safety crews cut the roof off Ryan Newman’s decimated Chevrolet yesterday; the latest in a too-long series of savage crashes that has plagued the Alabama track and its sister speedway in Daytona Beach, Florida. Everyone agrees that it has to stop. No one wants to think of what could happen in a worst-case Talladega scenario. But nobody seems to have a sure-fire solution, either. Opinions differ on how to keep cars on the ground and out of the catch fence. Some have suggested tearing down the banking at Daytona and Talladega. Speeds would almost certainly plummet without those awesome, 31-degree highbanks, but that option is economically unfeasible. Estimates for such a makeover top $50-60 million -- unthinkable in these difficult economic times -– and reworking two of NASCAR's most storied tracks would rob the sport of much of its history. Others advocate removing the restrictor plates, in an effort to spread out the pack and make crashes less likely. That solution ignores history, wrongly assuming that Talladega’s infamous “Big One” is the evil spawn of the restrictor plate era. In fact, NASCAR turned to restrictor plates only after Bobby Allison’s car nearly landed in the Talladega grandstands during the 1987 running of the Winston 500. Just days before, Bill Elliott had qualified his Ford Thunderbird on the pole with a now-unthinkable speed of 212.809 mph, and even then, there was a long and terrifying tradition of airborne racecars at Talladega and Daytona. Both Phil Parsons and Ricky Craven have nearly left the ballpark in memorable Talladega crashes. Others – Ricky Rudd, Rusty Wallace, Randy LaJoie – survived similarly hideous flyers at Daytona. A few were driving restrictor plate-equipped cars. Most were not. NASCAR continues to mandate restrictors plates simply because no better way has been found to slow the cars down. But even a smaller, 59/64ths plate did not keep the cars grounded Sunday. In the aftermath of two scary late-race incidents, fans and drivers are justifiably calling for action, demanding that something be done to prevent such incidents in the future. Unfortunately, even the men with the most to lose seem divided on what that solution might be. Shouting at NASCAR is a time-honored tradition, and while demanding that the sanctioning body do something may make us all feel better, primal scream therapy is no substitute for actual action. Clearly, neither of Sunday’s major crashes can be blamed on bump drafting. Both were the result of drivers attempting to protect their position by blocking on the straightaways. Despite complaints from some drivers that NASCAR tied their hands Sunday, the partial ban on bump drafting had no discernable impact on competition. There were long stretches of three and four-wide racing, and no shortage of passing throughout the pack. Clearly, they can race -– and race well -– without bump drafting. All parties agree on two goals; intense competition and safety for drivers and fans. Newman -– who has a degree in engineering -- invited NASCAR to pick his brain on possible ways to achieve both those goals, and the sanctioning body should take him up on that offer. Nobody understands a car better than the person who races it every week, and there are a lot of smart people in the Sprint Cup Series garage. NASCAR cannot be too proud to ask for help. Further, it’s time for both sides to put aside the adversarial “us against them” mentality that has punctuated restrictor plate racing over the years. NASCAR has no desire to endanger its brightest stars, and the drivers are not interested in staging single-file, follow-the-leader races. Both sides share the common goal of making NASCAR’s superspeedway events better and safer for everyone. I don’t know what the answer is, but I know it’s out there. It’s time to stop yelling and start talking.